Alice was a little stray brought in with her Sister in September 2015. She was nervous & shy but settled in happily with her foster mum. She was homed in March 2016. Alice was still a little nervous and unfortunately went missing only a month later. All necessary searches were done putting hundreds of leaflets through doors and posters on lamp posts. 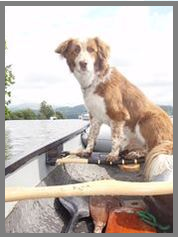 We Advertised on Social Media and Lost & found sites but Alice had disappeared without trace. Alice's owners and ourselves never gave up hope of finding her and on the 27th April 2017 I received a call to say Alice had been found. Thank goodness for microchips. Alice had been missing for 13 months in total and must have been surviving on whatever she could find. She was very thin and had a serious leg wound. Her lovely owners spared no expense to get her back to good health. This is Alice 7th September 2017 after her 3rd operation and skin graft under her leg. She has become a real softy and we don't think she will ever venture out of the house again. Alice is a very lucky girl to have such devoted owners who say she is part of the family and nothing is too much trouble for them to assure she is 100% better. This lovely boy was adopted at the ripe old age of 13 yrs. by a super couple who said his age didn't matter to them. After only a very short time in his new home Bruno developed a tumour and we decided to go ahead and emergency surgery was carried out to save his life. The tumour was massive but this brave boy came through the op with flying colours. Only 12 months before Bruno was involved in a RTA and, as a result of this, had to have an eye removed. ​We reckon that Bruno has used up at least two of his nine lives now. Howling like a wolf outside a home in Bolton the owners opened the door and in barged an old Staffordshire Bull Terrier with bleeding paws. The following day the people contacted Pet Rehome as no one else would take the old boy in. We named him Bulls Eye. Every thing was done to find an owner but as he was not micro chipped and had no ID disc and no one reported him missing we came to the conclusion that Bulls Eye had been abandoned. Bulls Eye spent nearly three weeks in our Vets as he was quite poorly and apart from his bleeding pads he was having regular fits. We felt Bulls Eye deserved a new start in life so everything that could be done was done. He had blood tests, x-rays, scans, etc etc. We had him neutered, vaccinated & chipped and he was worth every penny spent. He is a super happy dog that did not deserve the shabby treatment he had by his uncaring owners. Bulls Eye is now a resident with an "Oldies Rescue" who kindly offered to take him in as he still has minor fits but, never fear, he will have a lovely forever home and he has the best of everything. He loves to play games and is a happy content little soul. ​As you can see Zoe is so much better now than when she first arrived in our care. She had emergency neutering because of an open Pyometra infection and is still on long term medication for her skin infection. I think you will all agree she is in very safe hands. and Chance is her 2 year old son. painfully thin with severe skin dermatitis. and it was recommended she was PTS. 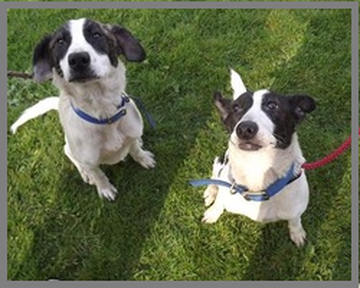 Pet Rehome thought these two little sweethearts were worth all their efforts. 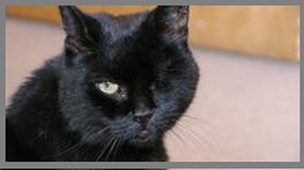 ​All Jasmines siblings found super homes but Jasmine proved to be more of a challenge. This little kitten was perfect in every way other than a skin problem that despite many hundreds of pounds spent on veterinary treatment and TLC from her devoted foster mum Jasmine continued to baffle everyone including the experts. Blood tests, skin scrapings and laboratory tests all came back negative, we left no stone unturned. We all thought Jasmine (now 8 months old) was destined to be with us forever, never to have a home of her own. BUT THEN ! a miracle happened - A lovely family came along and said Jasmine’s skin problem made no difference to their decision to adopt her. They gave her a lovely home. 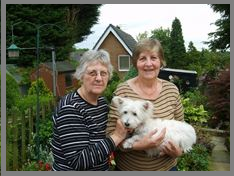 Petra, Jasmines friend, had already been adopted by this caring family and they were delighted to see each other again. Jasmine’s problem is still there but is gradually getting a little better each day. Her new mum has made her a special coat till Jasmine's skin problem is resolved. What a smart little girl she looks. 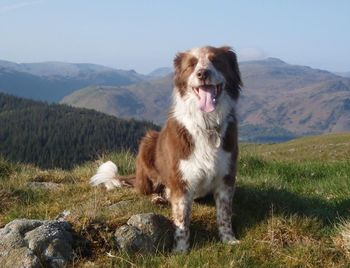 Sam, an 8 1/2 year old Springer Spaniel cross Border Collie, was adopted from a dogs' home in Manchester and after a few months was re-homed to an elderly gentleman in Bolton as the family thought Sam would benefit from a one-to-one relationship. 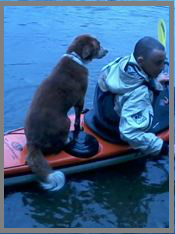 Unfortunately Sam ran away on his first day in his new home and that was in October 2009. Until 3rd March 2010 Sam had been running wild. I received a call from a lady on the 12th February. She had seen Sam for a few weeks scavenging for food and, being concerned and feeling sorry for him, decided to contact us as no one else would help her. After some investigation I uncovered Sam's story and asked the Bolton News to do a feature on Sam asking their readers to try and map Sam's activities. We were amazed by the public response and had dozens of phone calls. Unfortunately Sam was too frightened to be caught and despite many attempts he was still running wild. I had seen Sam in Bromley Cross in December and again in February. He had also been sighted in Westhoughton and all over Bolton. To my amazement and, in answer to my prayers, Sam actually came to my house late at night on 3rd March and allowed me to catch him. Do you think he knew we were trying to help? 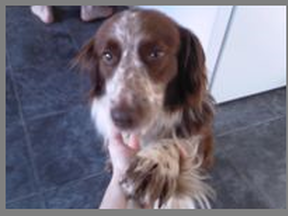 Sam went back to the original people who adopted him from the kennels - who said - they will never let him go again. ​Unfortunately, circumstances changed for Sam and everyone in the family were devastated to make the decision to ask me to find Sam a new home. I was mortified to get this news as I knew how much Sam loved his family but the Angels were on Sam's side and, as you can see from this photograph with Sam's new mum Sue, Sam is enjoying life to the full. Any offers from budding directors please feel free to contact us. Dear Kathy, We wanted to let you know that Sam is going to sleep this afternoon 3rd November 2016 and will be laid to rest in our garden. Thank you so much for giving us the opportunity to give him a new home. He has given so much to us and many others. Hopefully the years he has had with us in Bacup and up here in our new house in the Lake District has more than made up for his trials in the past. So many people love him and he will be missed by us all.